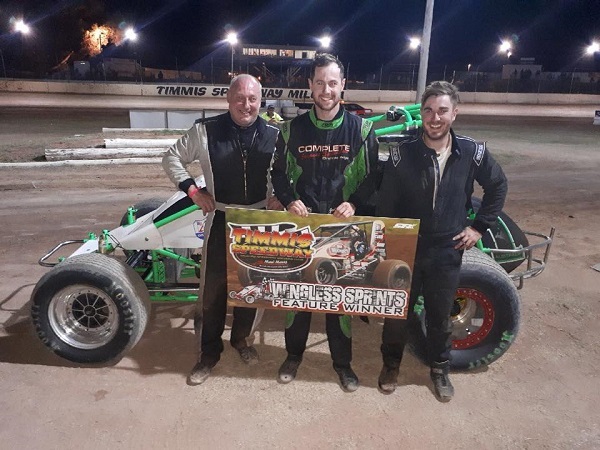 Carrying on from his successful Australian Championship defence recently, Joel Chadwick created history over the weekend at Mildura’s Timmis Speedway by claiming his third South Australian Wingless Sprint Title win in a row. In scorching conditions at the track, Chadwick was able to overcome not being entirely happy with his performances over the weekend but was able to hit form and come out on top when it mattered the most. Following Chadwick across the finish line in the SA Title decider was fellow South Australian Joel Heinrich in an impressive second, while veteran Tony Moule (Vic) came home in third place. Youngster Todd Hobson (Vic) had earned the right to start from pole position, however he elected to start from the outside of the front row, for the 30-lap SA Title decider, due to his highest point-score status after the qualifying heat races. On his inside was Chadwick, followed by an all-Victorian second row with Dayn Bentvelzen and Luke Storer and then on the third row was Heinrich and Moule. At the drop of the green, Hobson went straight into the lead with Chadwick and Heinrich in pursuit. Hobson was struggling with setup as the laps were ticking over and on lap 10, Chadwick took control of the lead. Hobson went from position one to position four within the space of two laps. Meanwhile, Chadwick was taking the race in his stride setting up a margin over the rest of the field. As the laps wound down it became very clear that Chadwick was going to create history and at the drop of the chequered flag he was nearly four seconds clear of second. Heinrich had a strong weekend in the chase for the SA Title, celebrating a runner-up finishing position. Heinrich was considered one of the contenders for the event, having recently won a feature-race at Waikerie’s Sunline Speedway. Heinrich began the event from position five and quickly marched into the top three. On lap 10, he moved into second and despite putting in a gallant effort at trying to catch Chadwick, had to settle for the runner-up position. Bentvelzen, who started the feature-race from position four, had an up and down race and came home in fourth. He had dropped outside the top five at the beginning of the race before regaining the two positions he lost as the race progressed. Anthony Tapley improved on last year’s SA Title result, where he finished eighth, to complete the top-five finishers. The Murray Bridge, SA resident put in a strong showing all weekend, and in the feature race, where he was sitting in seventh for most of the race before moving forward to finish fifth. Hobson faded towards the end of the race record a sixth-place finish ahead of Luke Storer (Vic), Jake Ashworth (SA), Matthew Kennedy (SA) and Jay Brown (SA) in 10th. Nic Green (Vic) placed 11th ahead of Michael Spoljaric (SA), Travis Beasley (SA), Jaidyn Job (Vic), Brad Evans (SA), Shaun Lyness (Vic) and the final finisher Brad Beasley (SA). Non-finishers were Travis Evans (Vic), Spencer Taylor (SA) and Jordon Bolitho (SA). The B main on the second and final night was a win for Brad Evans ahead of Taylor, Travis Evans and Lyness. Heat races on the opening night went to Storer, Chadwick, Hobson, Heinrich, Moule and Brown. There were another two rounds of heat races on the final night with victories going to Hobson (x 2), Spoljaric, Hobson, Travis Beasley, Storer and Bentvelzen. Despite finishing second in the night one preliminary feature race, Chadwick was still the highest on points after the opening night of competition. The 20-lap curtain raiser was taken out by Bentvelzen in impressive fashion ahead of Chadwick and Heinrich in second and third place respectively. One of the weekend’s hard-luck stories was Mitchell Broome. The SA front runner sadly blew an engine at the beginning of night two. Sadly, for Broome, that was the end of the weekend for him. For further AWSR information, visit their website www.awsr.com.au or LIKE them on Facebook or follow them on Instagram and Twitter by searching Australian Wingless Sprint Racing.